We are a leading Manufacturer of suspended platform and cradle system from Rajkot, India. We hold specialization in designing and developing Cradle System. 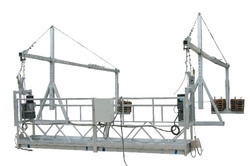 These platforms are precisely designed for temporary or permanent applications of lifting people and their working equipment at heights at construction sites.